Scientists have found strange "dust moons" around Earth that follow our planet from afar. In this image, the central region of the Kordylewski dust cloud is visible (bright red pixels). The straight tilted lines are traces of satellites. The L5 point in white is the Earth-moon L5 Lagrange point. Dust clouds that orbit Earth like moons may finally have had their existence confirmed after more than a half-century of controversy, new research finds. In deep space, there are five points where the gravitational pull of Earth and the moon balance each other. Two of these so-called Lagrange points, L4 and L5, form an equal-sided triangle with Earth and the moon, and move around Earth as the moon orbits the planet. Any objects at either L4 or L5 can stay in relatively stable positions there about 239,000 miles (384,000 kilometers) from both Earth and the moon, barring any interference from the gravitational pulls of the sun and other bodies. Now researchers suggest they may finally have confirmed that this pair of dust clouds is real. The scientists detailed their findings in two studies online Sept. 1 and Oct. 1 in the journal Monthly Notices of the Royal Astronomical Society. Artist's illustration of the Kordylewski cloud in the night sky (with its brightness greatly enhanced) at the time of the observations. The Kordylewski clouds are exceptionally faint, and whether one can see them with the naked eye or normal cameras depends heavily on the state of the weather. As a result, many scientists have doubted their existence for decades, Gábor Horváth, a physicist at Eötvös Loránd University in Hungary and co-author on both studies, told Space.com. The scientists first developed computer models of the Kordylewski clouds to see how they formed and how light scattered off or reflected by these clouds might be detected. They focused on a feature of this scattered or reflected light called polarization. All light waves can ripple up and down, left and right, or at any angle in between, and scattered or reflected light is typically polarized much the same way, depending on the angle of scattering or reflection. The researchers next sought to detect the Kordylewski clouds using a digital camera at a private observatory in Hungary. The camera was equipped with polarizing filters that only let in light with specific polarizations. "Now we find new observational evidence for the existence of the Kordylewski dust clouds around the L5 point of the Earth-moon system," Judit Slíz-Balogh, an astronomer at Eötvös Loránd University in Budapest and lead author of both studies, told Space.com. 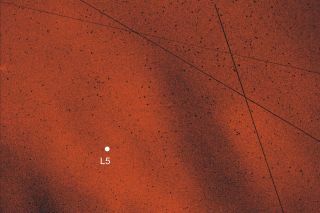 Mosaic pattern of the angle of polarization around the L5 point (white dot) of the Earth-moon system. The five rectangular windows correspond to the fields of view of the imaging polarimetric telescope with which the polarization patterns of the Kordylewski dust cloud were measured. Images of the purported location of a Kordylewski cloud revealed polarized light reflected from dust extending well outside the camera's field of view. This matches predictions the scientists made of how a Kordylewski cloud would look. "The Kordylewski clouds are two of the toughest objects to find, and though they are as close to Earth as the moon are largely overlooked by researchers in astronomy," Slíz-Balogh said in a statement. "It is intriguing to confirm that our planet has dusty pseudo-satellites in orbit alongside our lunar neighbor." In the future, scientists can see whether dust clouds also exist at the Earth-moon L4 point, Slíz-Balogh added. Given the stability of the Earth-moon L4 and L5 points, they are often seen as potential sites for space stations. Future research into Kordylewski clouds may see how stable they are and whether their dust poses any potential threat to equipment and astronauts at the L4 and L5 points, the researchers said.